General purpose natural rubber offers general all round usage. Not recommended where oil and petroleum products or organic solvents are present. Used for gaskets and seals in water and low acid applications. Not suitable for exposure to outdoor weather applications. Natural rubber insertion with cotton reinforcing. Used extensively for pipe flange gaskets. It offers good resistance to caustics and alkalis, but is not recommended for oil, petroleum products or organic solvents. A premium grade natural rubber with excellent cut and tear resistance. Used in applications where high abrasion resistance is required. Typical applications include hoppers, bins, silos, vibrators, conveyors, hydro cydones, slides and chutes. General purpose Neoprene (CR) sheeting offers good weathering, heat and fire resistance. 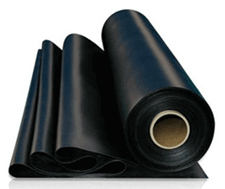 Neoprene sheet also has a moderate resistance to petroleum based products. 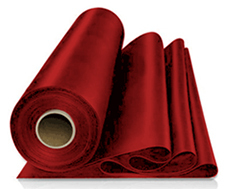 High grade Nitrile (NBR) sheeting is a multi-purpose rubber with good resistance to petroleum based fluids. It’s also suitable for use with alcohols, mineral oils, hydraulic fluids, animal and vegetable fats. Food Grade White Nitrile is a multi-purpose synthetic grade rubber compounded that meets FDA requirements. It is suitable for use with alcohols, minerals oils and animal and vegetable fats. Primarily it’s used for seals and gaskets in the food and pharmaceutical industries. EPDM rubber is a synthetic rubber ideal for external use where higher temperatures are likely to exist. Excellent ozone, weathering and elevated temperature resistance. This rubber also offers an increased resistance to acid and general chemicals. High grade Silicone synthetic rubber has a wide temperature range. It offers reasonable resistance to weak acids and alkalis and mineral oils. It has very good electrical properties and is virtually impervious to UV light. Generally resistant to moderate or oxidising chemicals, ozone and concentrated sodium hydroxide. General purpose Viton Fluoroelastomer: Viton rubber or (FKM) has excellent heat resistance, good self extinguishing properties, resistance to ozone and weather elements and chemicals. Of all the synthetic rubbers Viton (FKM) offers the most resistance to hydrocarbons - aliphatic as well as aromatic and chlorinated. On the other hand ethers and cetones can cause considerable swelling.ions.